Three clades of jawless fishes are united by the possession of a massive head shield that covered the gills dorsally and ventrally-opening gills (see Box 3.1), i.e. the Osteostraci, Galeaspida and Pituriaspida. The Osteostraci, including some 300 species, arose in the Ordovician, and radiated in the Late Silurian and Early Devonian (Janvier, 1996). These were the first vertebrates with paired fins. They are heavily armoured in the head region, and most have a flattened curved semicircular head shield shaped rather like the toe of a boot. Hemicyclaspis from the Late Silurian of Europe and Canada has a solid carapace made from a single bony plate that enclosed the head region (Figure 3.10(a)). Behind the head plate is a pair of pectoral fins covered with small scales, and these could presumably have been used in swimming (see Box 3.2). Tremataspis and relatives lack pectoral fins. The body and tail are covered with broad scales on the side and beneath, and narrower ones on top which form a dorsal ridge and a dorsal fin. 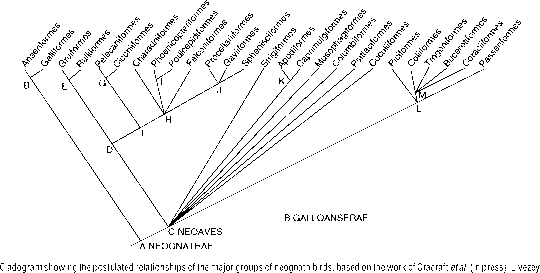 In the course of their evolution, the head shield of osteostracans adopted a variety of forms, ranging from an elongate bullet shape in some early examples, to rectangular and hexagonal forms, some with backward-pointing spines, or cornua, and one even with a long rostral spine in front (Figure 3.10(b)). 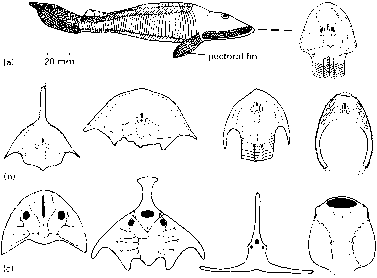 of processes (Figure 3.10(c)): curved cornua pointing backwards, a 'hammer-head' rostral spine, and pointed snout spines that are longer than the head shield itself. Some forms also have very long lateral spines that may have acted like the wings of a glider during swimming, to maintain a stable body position. Galeaspids lack paired fins. Galeaspids have their mouth just beneath the head shield, and they have a single nostril at the tip of the snout that may be a transverse slit, a broad oval, a heart shape, or a longitudinal slit. Some galeaspids have up to 45 gill pouches, the largest number in any vertebrate. The pituriaspids are represented by two incompletely preserved species from the Early Devonian of Australia. They share a heavy, bony head shield with osteostracans and galeaspids, and they have unusual, large openings immediately below the eyes.